Irregular shaped bottles of varying sizes, shades and styles – nail polish. You can’t stack ’em, slot ’em together and there’s only one way up for them! No wonder they give me a headache. Into a brand new Ikea Helmer! Oh, Ikea Helmer… you are the stuff of makeup-lover’s dreams. Perfectly sized, you’re small enough to be considered compact yet spacious enough to hold our treasures within your functional (but not too officey) exterior! The Helmers comes in white, red or silver and are priced at just over £20 each. I own two white Helmers and they hold SO much crap it’s astounding. But at over £80 a-piece, the price difference is hard to justify. Here’s a quick phone snap of my polishes all snug and comfy in their new home. Look how perfect they are, all divided by colour and standing to attention! But my favouritest thing about their new home? It means I now have plenty of space for more! How do you store your nail polish – do you own a Helmer? That’s what I use to store mine, but I need to find some sort of divider/sectioning thingy so I can find colours a bit easier (I have my sorted by colour at the moment, but it’s all a bit of a mess). Mine are in a box that I got a Body Shop gift set in at Christmas. It’s lined up by colour so I can see how many similarly-coloured purple polishes I have, whoops. 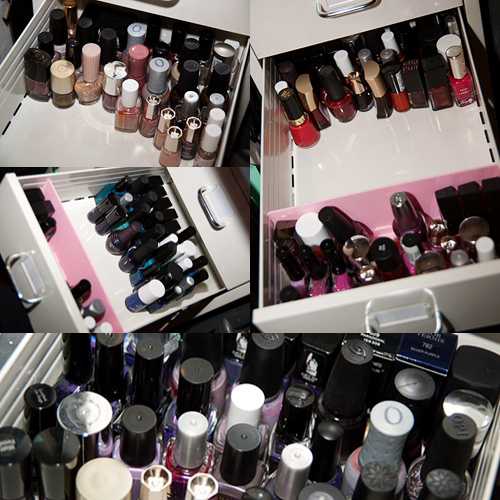 Looks like a lot of people use the Helmer for nail polish storage! Fortunately I don’t own that many nail polishes… yet. I have an ikea set of office drawers (not the helmer) that isn’t tall enough (or spacious enough) for all my makeup and polishes. I get annoyed at my D&G polishes – packaging is gorgeous, but they’re too tall! Even OPI I can’t stand up in my current storage. The Helmer looks great and is really well priced. I need to reconsider my storage as I want it more organised. So jealous, I want a Helmer but they are $129 here is Australia & I just can’t justify one. The Alex is ever worse at $300, Australian pricing is the worst. I kind of want an Alex of my own, actually, but I don’t have that much polish yet! I started with two Helmers, and have since added two Alex’s! Alex’s are so worth it. Oooh, what a bargain! I put my polish in one of those WH SMith storage boxes, but a lot of my polishes are too tall so either lie down and roll around or are located in various little boxes all over the place. I dislike going to Ikea though. Last time I went I took me about 10 mins to find the entrance! Who puts it on the top floor? Lol! FragrantWitch, you and I are in the same boat. I have only half a drawer of polish, and I’ve been giving away some of the bottles I rarely use because I felt I had too much! I use a helmer for my nail polish. It’s nowhere near full, but it’s such a cute little storage device. I keep mine in a cutlery tray in my dressing table drawer. I have a fear of them falling over and leaking so the cutlery tray gives protection and divides colours and base coat etc. Like the look of the Helmer. My polishes go into a vanity case my aunty bought me years ago. The rest are dotted around somewhere. I do not have that much. Though the Helmer looks like it would be a problem solver for me. I could use it to store my makeup and then just have a small traincase for my everyday wears. I hope the folk at Ikea wont find me weird if when I go I bring a few makeup and try them in the drawers. My version of try before you buy. Great idea for storage. now I have a new excuse to go Ikea. Is it wrong to want the Helmer for my pityful 12 bottles of nail polish?! Did the pink dividers come separately from Ikea? No, I bought the dividers seperately from Deal Extreme… they’re not brilliant but they do the job! Eee, thank you SO much for posting pics of this! 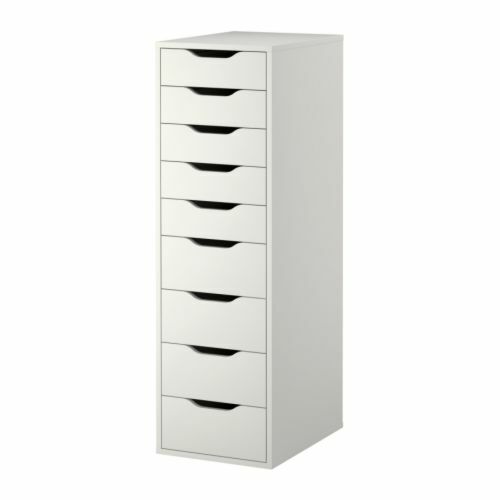 I’d been wondering if an Ikea helmer would be big enough to hold my makeup collection – if it can fit 208 polishes, then it certainly can! Thanks, a HUGE help! I use sturdy cardboard photo storage boxes. The polishes all stand up perfectly in them. At this point I separate them by brand and just finished painting all of my nail wheels to make a list/ road map for them. One of these days though I would love to get a Helmer! Oooh! Now I want a Helmer. My nail polishes are taking over the fridge! 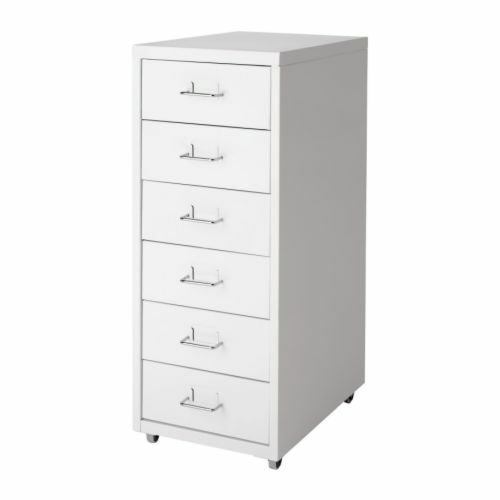 I had 2 Helmers and upgraded to an Alex (the shorter, wider one with 6 drawers) and I couldn’t be happier. You can only put polishes/lipsticks in the bottom 3 drawers because the top 3 are a little shallower, but all my drawers are filled and I don’t have an issue with the drawers falling out, which happened a lot with my Helmers. Maybe when Leila needs a desk you can give her your Helmers and replace yours with Alex? I thought I was the only one who used this for nail polish. Mine is red. I actually have the Alex and I’m so glad. But then I’ve got a hell of a lot more stuff to put in it because doing nails is how I make my living, I’m a fully trained nail technician. Having said that, I would have totally opted for the Helmer if I couldn’t have had the Alex. I have a red helmer to store my nail polish in. It’s great! I have an Alex as well the tall white one and the shorter black one. I love them all. Great storage solutions. I use neat little pouches which enable me to seperate my colours and keep them safe and securely in my case, draw or cupboard. I have a Helmer and it’s filling up nicely….did look for the Alex when in IKEA the other day but couldn’t find it. Why is it better?? Boots iPulse Smooth Skin IPL in action!